Sqwops can be found throughout all SqwRegions of SqwishLand. They offer a variety of super cool items for your SqwAvatar and SqwishHome. 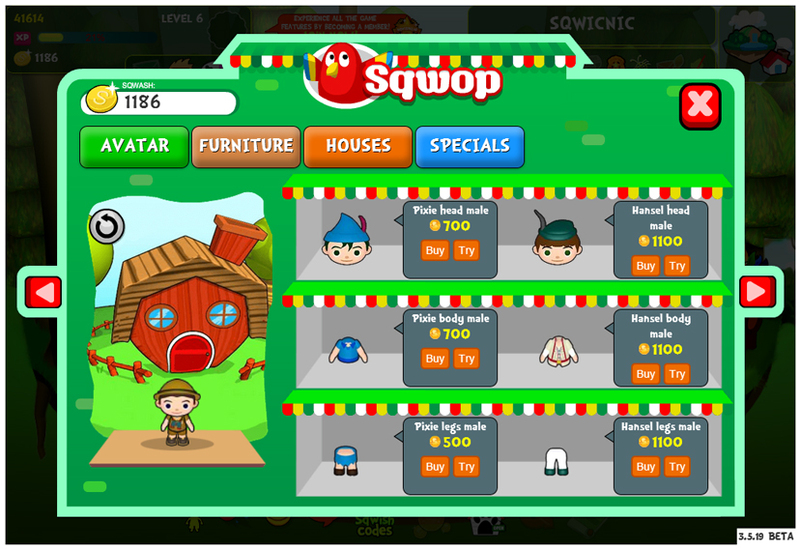 Play games to earn Sqwash to spend at the Sqwops so you can journey across SqwishLand in style! Mix and match hundreds of costume options to pick out a style that best suits you! Here is where you can buy tons of furniture and accessories to decorate your SqwishHome! There are dozens of items that come in a variety of chairs, tables, wall paintings, and so much more to choose from! When you really want to stand out from the crowd, try saving up for an awesome new SqwishHome! When your friends visit, they’ll be blown away by the incredible change in scenery! These items increase your ability to explore various parts of SqwishLand. For example, you can’t visit any underwater areas without a proper set of Scuba Gear – after all, safety first!